This past 10 days have been action packed down in Everglades National Park, days of 30 Redfish and 40 Snook have been common. Timing the tide which has been extremely high and low around the full moon was important. On the high tides they were way back in the sticks and on the lows, well right out in the open. Live shrimp worked good but Gulp products worked really well on Redfish and Snook. The Rapala "Twitch n Raps" produced allot of Snook, this is my go to lure! It was no one secret spot, the bite was good out front on Snake bite in the run offs Palm and Frank Keys. These places have no grass but the fish are still hanging out there. Of course east Cape canal has plenty of fish all you need is Shrimp on the bottom. I fished with regular client Sam and his son Mike in Government Cut and South Biscayne Bay. They had Snook, Mutton Snappers, Mangrove Snappers, Cuda's, Jacks, Mackerels, Blue Runners and Yellowtail. I am at Flamingo with Jorge, his son Gus and grandson Aden. Aden is 8 and all he dreams about is fishing while at home in Virginia. today is the first time he has ever got to go and I was gonna make it a special day for him. On our first stop he caught his first Snook, Trout, Ladyfish and a Mangrove Snapper. We moved around and hits allot of spots because the water was dirty from the recent west winds. Eventually I found some clean water and the fish were there. We caught 25 or so redfish and then a bunch of Snook. The out going tide cleaned up the water enough that we found the mother load of Trout, Jacks and Ladyfish on the way in. Aden was really happy and fell a sleep on the ride in. I am fishing Government Cut today with Brian and April. On the way out we found some Pilchards and that did the trick. The first fish was a nice Barracuda so was the second then is was a Mutton, a Dog Snapper, a Schoolmaster Snapper and something that pulled allot of drag. It was like this all day until what I think were Goliath Groupers showed up. We had fish get eaten and then the bigger fish just hug the bottom. this happened 7 times and Brian and April would get them half way up and then they would go back down and not budge. It was a blast and Brian is a good angler did his best but no luck at all. We did manage more fish in between the ones that were eaten. Big Mackerels, decent Jacks, Yellowtails, more Muttons and a big Mangrove Snapper. It was allot of fun but it wore them out calling it a day @1230. Today is my annual Christmas trip gift for my nephews Mark and Andrew. They wanted to fly fish and of course it was blowing 30 mph. We caught some fish but made our way north and found the mother load! We were throwing Rapala "Twitch n Raps" and like every year Andrew hooks a big Snook, he does this every year. He is a very good angler and caught a 36 inch Snook. The little guys were mixed in and before long we had over a hundred Snook. We moved on and found more Snook along with some Redfish under the Mangroves. The next spot had Taron a couple weeks ago but today it was the tiniest Snook I've ever seen. There were hundreds of them so they broke out the fly rod. Andrew caught a bunch and the Mark caught a few then I said lets go. Tried some new stuff I had never fished and found a load of Redfish, every cast produced a fish and they were 3 at a time. It was a fun day considering a 30 mph cold wind and no sun at all. We caught over 200 Snook and 50 Redfish and 20 Trout not all giants but it was a great day of getting bites. I'll always ask if the anglers was to stay or leave most people will not leave a red hot bite to look for some thing else. Kids are smart that way! I am with Brian his sons Braden and Braxton and friend Brooks. We started out catching Trout, Jacks and a Redfish so I decided to try the pattern from a couple days earlier. I ran to where the Snook were but they weren't as thick, today it was Redfish. These 4 anglers hooked and caught over 100 Redfish on a couple spots today with about 30 Snook. The rest of the day was easy a few mid slot Snook, big Trout and of course lots of Redfish. I am fishing Flamingo with Tony Delamanza and his 2 nephews Marco and Julian. We started out with Trout and then kicked it into high gear. We caught a bunch of Redfish and small Snook. We were fishing trees in shallow water which were holding big Trout. Marco made a cast up around a big tree that was laying sideways and got rewarded with a really nice Snook. 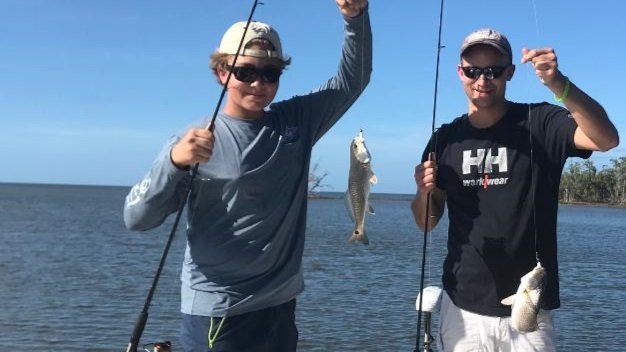 I am fishing Flamingo with Eric Shields his son Kol and his mom Oss We worked the whole back country catching Trout, Jacks, Ladyfish and a Cubera Snapper. We bounced around until getting to a spot that's been really good for me. We cast live shrimp and Gulp on jigs and it was just silly, every cast was a Snook, Redfish or Trout. This lasted for about and hour and then it got really shallow and I had to move. The next spot only produced a big Snook for Kol but we worked the shore line down and away from it and it was fantastic! There were Redfish in the mullet schools and Eric started to catch one on every cast. Kol and mom joined in and for about 2 hours it was a Snook and Redfish party. They really enjoyed it! Newer PostNew Year is on Fire! Older PostGo fishing for Christmas!